Follow the below steps to start working with RadToggleSwitch. This control is very much configurable and you can put button and header styling as per your application requirement. Very first you need to add reference of Telerik.Windows.Controls.Primptive on xaml. 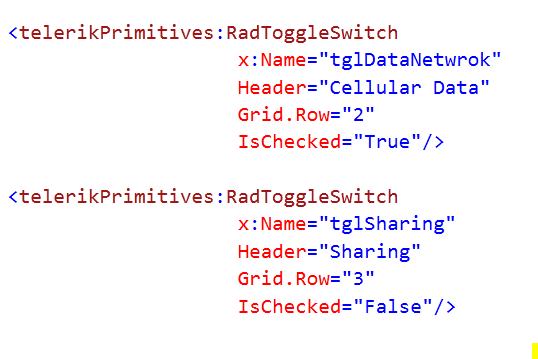 While adding RadToggleSwitch we can configure value of header. If needed, you can define HeaderStyle and HeaderTemplate specific to your application. By default accent color of device get applied as background color of RadToggleSwitch. You can set IsChecked property to either true or false. If you do not set it then it takes default value false. One important property is ButtonStyle. You can configure this property to give different look to toggle button. Below is the consolidated code. 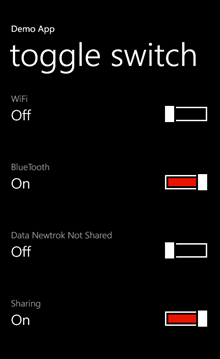 On the xaml we have put four RadToggleSwitch control. When you run above application you should get expected output as following. 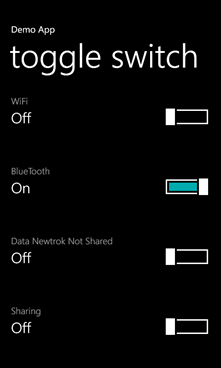 When you toggle Data Sharing button, you will notice header is getting changed. In this way you can work with RadToggleSwitch. I hope you find this post useful. Thanks for reading.